C.1910, Ansonia, La Savoie, Royal Bonn Porcelain china clock in very good condition. The only thing that keeps this from being excellent is a chip in the dial around 2 that has been glued back in and the numeral touched up with black enamel, (noticeable, but not terrible). These replacement chapter rings are available from several suppliers: Timesavers stock no. 20111 is priced at $29 for both the center and chapter ring. 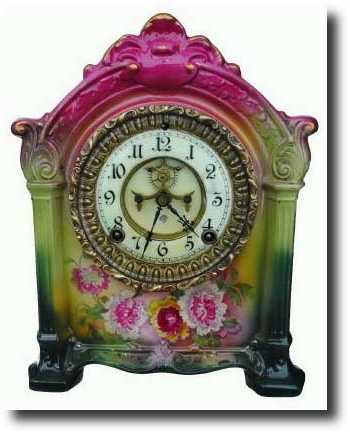 The rest of the clock is clean and nice; tri-color motif, dark pink at top to lime green and down to forest green at the base. Runs and strikes fine. Height 11"